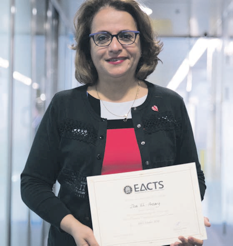 Dr Doa El-Ansary was recently awarded the Inaugural Allied Health Award 2017 at the recent European Association of Cardiothoracic Surgeons (EACTS) meeting in Barcelona this month. The award and project also received media coverage with a feature article in the Daily Times at the meeting. Dr Doa El-Ansary; Professor Alistair Royse; Professor Colin Royse; Dr Johan Heiberg; A/P Adam Bryant; Dr Mark Howard; Dr Melinda Jackson and Professor Linda Denehy.